The $1,000 buy-in Hyper Hold’em tournament debuted at the WSOP for the first time, with a breathless blind structure which forced plenty of action and determined a champion in just two short days, despite yet another big field size packed into the Rio Las Vegas. A total of 1,436 players signed up for the tourney with lightning-fast 20-minute rounds, considerably shorter increments than the standard tournament structure. 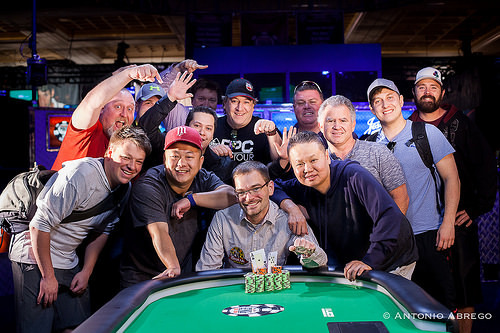 The result was just one day of play to reach the final table, followed by the quickest finish for a nine-handed final table in recent memory. John Reading collected $252,068 in prize money for the quick victory. He also earned his first gold bracelet, a personal milestone. Reading is a 26-year-old poker pro from St. Paul, MN. He has played full-time for several years, with most of his previous success coming from online poker games. Reading has pocketed six-figures in the past, but nothing could compare to the thrill of winning on the biggest live stage in poker here at the WSOP. Despite the fast action and quick finish, getting to this stage took a considerable time, effort, and lots of patience. Reading initially got into poker when he watched televised poker shows, including the WSOP and the World Poker Tour. In addition to achieving much online success, Reading also demonstrated the ability to adjust to live play earlier this year when he went to Horseshoe Council Bluffs and won a WSOP Circuit gold ring. Hence, he now has both a gold bracelet and a gold ring, and the year isn’t even half over yet. Second Place: Marc McDowell, from Dublin, Ireland finished as the runner up. He’s the highest non-American finisher so far at this year’s series. 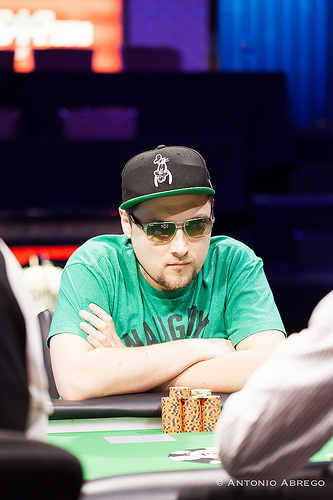 McDowell is a 28-year-old poker player who cashed for the sixth time at the series. Second place paid $155,876. Third Place: Harrison Beach finished in 3rd place. He is a 23-year-old self-employed man from Las Vegas, originally from New York City. He’s also a Magic the Gathering convert to poker. This marked the fourth time Beach has cashed at the series, worth $98,623. Fourth Place: Alexsandr Gofman, from Ekaterinburg, Russia took 4th place in what was his second WSOP final table appearance in two years, after finishing fifth in an event last year. 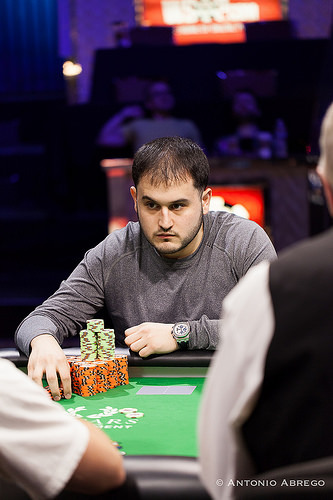 Gofman, a 28-year-old poker pro, earned $71,586. Fifth Place: Matt Woodward took 5th place. He is a 32-year-old poker pro and former lifeguard from Seal Beach, CA. Woodward earned $52,807 in this, his 20th in-the-money finish at the WSOP. Sixth Place: Robert Suer, a a poker player from Dana Point, CA took 6th place and collected $39,547. He now has ten cashes as the series, plus seven more on the WSOP Circuit. Seventh Place: Kenneth Johnson, a 30-year-old drywall construction worker from Lakeville, MN finished in 7th place. He also finished seventh in a WSOP Circuit held last season in New Orleans. This time, Johnson earned $30,048. Eighth Place: Ryan Julius ended up in 8th place. He is a poker pro from Peoria, IL. They payout was $23,133. This marked the 17th time Julius has cashed at the WSOP in Las Vegas, in addition to three WSOP Circuit finishes. Ninth Place: Wayne Boyd finished in 9th place, the first to bust out from the championship finale. He is a 57-year-old senior vice-president with the Orion Marine Corp. Boyd has now cashed 5 times at the WSOP. Two-time winner Jason Mercier cashed for the 42nd time at the WSOP. 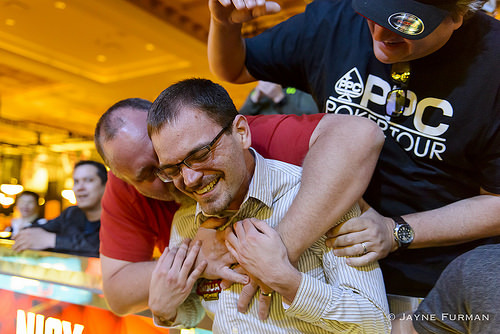 Two-time winner and 2012 world champion Greg Merson cashed for 13th time and second time this year at the WSOP. Hollywood movie and television actor James Woods cashed for the second time this year, after finishing seventh in Event #4. Although similar “Turbo”-style events have been held in the past, this was the first “Hyper Hold’em” event at the WSOP. 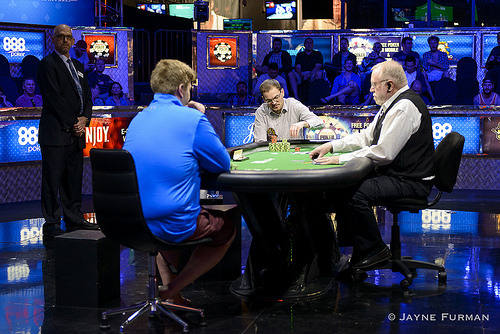 Clocking in at less than two hours of actual playing time, the final table is believed to be one of the quickest finales in the WSOP modern era. Marc Macdonnell open-shoves for his last 1 million, and John Reading makes a quick call. Reading has the best hand with ace-high, and his rail immediately roars their approval, calling out for an ace to end things. The flop comes and Reading's hand holds up through the hard part, but Macdonnell picks up a gutshot straight draw. The turn brings the on board, changing nothing, and the is delivered on the river. John Reading wins the first ever Hyper Hold'em event at the WSOP, earning a $252,068 prize and his first gold bracelet. Marc Macdonnell finishes as the runner-up, taking home $155,876 for his efforts. John Reading opens and takes down an uncontested pot. Marc Macdonnell gets a walk. John Reading gets a walk. John Reading limps in from the small blind, and Marc Macdonnell checks his big blind option. The two check through the flop, and the turn is the . Macdonnell leads out for 100,000, Reading calls, and the river comes . 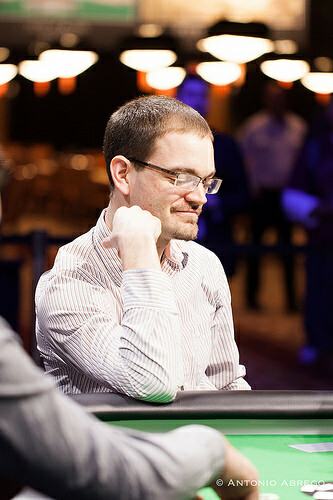 Macdonnell flicks out a 220,000 bet and Reading counts out the calling chips, before pausing to think things through. After thirty seconds he moves those chips forward for a call, and when Macdonnell doesn't table his cards, Reading rolls over for ace-high and the win. John Reading limps in from the small blind and Marc Macdonnell raises it up to 305,000. Reading stares him down from across the table, before sliding his hand to the dealer. Marc Macdonnell raises from the button to 160,000 and John Reading moves all in. Macdonnell thinks about it for a few seconds before releasing his cards into the muck. John Reading and Marc Macdonnell are now heads up playing for the $252,068 top prize, along with the WSOP gold bracelet. John Reading opens to 160,000 from the button, Harrison Beach three-bet jams for 1,980,000, and Reading calls him down. Both players find ace-high hands, but Beach's ten kicker gives him a dominant advantage - much to the delight of his boisterous rail. The dealer fans a flop though, sending the lead back over to Reading. Now it's Beach who hopes to pair his kicker, but the turn comes . This adds an open-ended straight draw to Beach's arsenal of outs, but the on the river is a brick. Marc Macdonnell raises to 160,000 on the button picks up the blinds and antes. Marc Macdonnell opens to 200,000 from the small blind and takes an uncontested pot. Reading raises 160,000 from the button and picks up the blinds and antes. John Reading opens to 160,000 from the small blind and Harrison Beach calls from the big. The flop comes and Reading leads out for 140,000, good enough to force a fold by Beach. Marc Macdonnell raises to 160,000 on the button and Aleksandr Gofman moves all in from the small blind for 975,000. Action is on John Reading in the big blind who announces he is all in and Macdonnell folds. The board runs out and Aleksander Gofman is eliminated in 4th place, taking home $71,586. Marc Macdonnell opens to 200,000 from the small blind, and after tanking for two minutes, Aleksandr Gofman decides to wait for a better spot. John Reading raises to 160,000 on the button and everyone folds. Marc Macdonnell opens to 170,000 from under the gun, and Aleksandr Gofman three-bets to 350,000 from the button. Macdonnell responds with a four-bet shove to put Gofman at risk, and the latter surrenders the pot after a brief tank.